Great leaders absorb. Mediocre leaders defend. Learning this simple leadership principle will yield stunning results for any leader that commits to it. Absorbing criticism without being defensive seldom comes naturally for a leader. 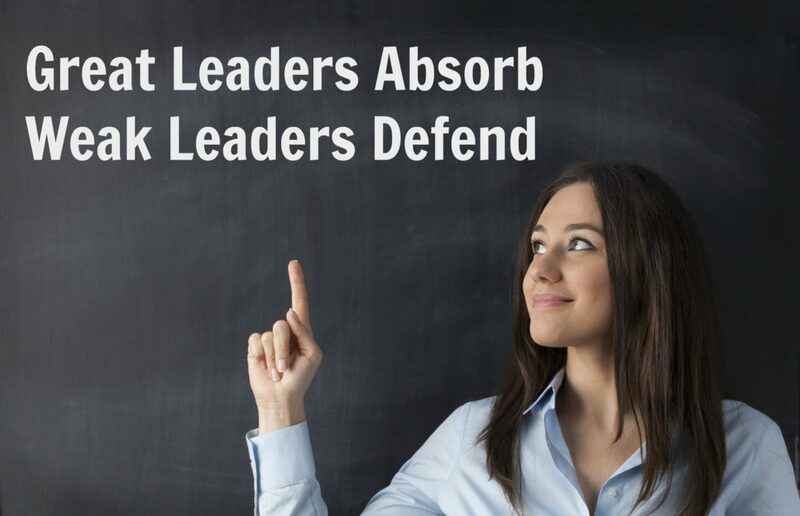 But learning to absorb rather than to defend is one of the marks of mature leadership. A mature leader listens and reflects. A novice leader argues and defends. Why Absorb Rather than Defend? There may well be something that you can learn when criticized. Offering an instant defense in the face of feedback may potentially stop the learning process. When a person presents you with critical feedback, look for an opportunity to learn. Consider as well whether the criticism is coming from a friend or a person with a critical spirit. Criticism from a trusted friend likely contains truth, where other criticism may aim to tear you down. Your immediate response to criticism will often not be the right one. Get away from the emotion of the moment. You don’t have to respond right away. You may not even need to respond at all. Reflect on the feedback. Think through a rational response. Time is your friend. When a person comes to you with feedback or criticism, she is often only looking to be heard. Listen and acknowledge her point of view. When a person simply wants to be heard, you are wasting energy to try to argue your point. Listen and reflect. Later, you will know if a response is necessary. Steve Covey taught this principle in his book, The Seven Habits of Highly Effective People. Seeing my point of view is easy. It takes work to understand deeply another’s position. You can’t understand another’s point of view when your default response is to offer a quick defense to criticism. Consider carefully the other’s point of view before offering your own. If you can’t handle criticism, then you shouldn’t lead. You have accepted the opportunity to be in a public position. Criticism comes with the territory. If you stand for anything, someone will disagree with you. When you receive feedback or criticism of any kind, make your default response, “Thank You for pointing that out. I will reflect on it.” Pray. Seek counsel if necessary. You may need to offer a defense in time, but don’t make it your first response. A wise leader listens and reflects.